앞면 Dog with the wight and purity around the rim and the Chinese symbol for dog. 뒷면 The Rwanda coat of arms. Dog with the wight and purity around the rim and the Chinese symbol for dog. 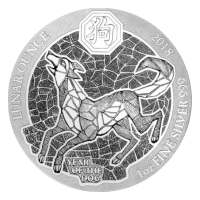 1 oz 2018 Rwanda Lunar Year of the Dog Silver Coin Purchase your 1 oz 2018 Rwanda lunar year of the dog silver coin from our store today for the lowest price online! This silver coin represents a refreshing meeting of cultures; second in Rwanda’s lunar ounce series, the coin celebrates the symbolism of the Chinese lunar calendar. The coin’s reverse features a unique mosaic style rendition of man’s best friend, the Dog, with contrasting texturing to further highlight its features. Framing this art-scape, the Chinese character for ‘Year of the Dog’ and the same title in English, as well as the coin’s purity, year of release and series name. The obverse feature is an intricate portrayal of the Rwandan coat of arms, complete with its host of Rwandan heritage symbols. Below the image you’ll see the number 50, as this coin has a denominational value of 50 Francs (legal tender), as well as the words ’50 Francs’ and ‘National Bank of Rwanda,’ all written in Kinyarwanda, the national language of Rwanda. The language of Kinyarwanda joins English and French as one of Rwanda’s three national languages, spoken by the 12 million citizens of this magnificent African country. Celebrate two rich and fascinating cultures in one and expand your holdings with the 1 oz 2018 Rwanda lunar year of the dog silver coin today.